As I am sitting down to get this written I have to laugh at myself because, with the best intentions, I feel like I only got half of what I planned to do completed. 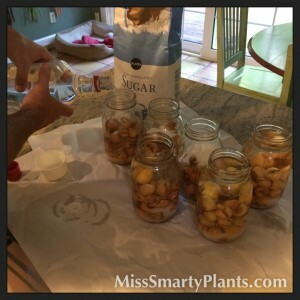 Two weeks ago I said to Mike that we were going to try to make as many different loquat recipes as possible. Well, we only got two things completed and they both involved alcohol. Huh. Botanically, loquats are in the Pome family, along with roses, apples and pears. The scientific name for loquat is Eriobotryae japonica. Loquats are sometimes called Japanese Plums as well and in addition to producing these tasty little fruit they are a beautiful small tree for Florida. 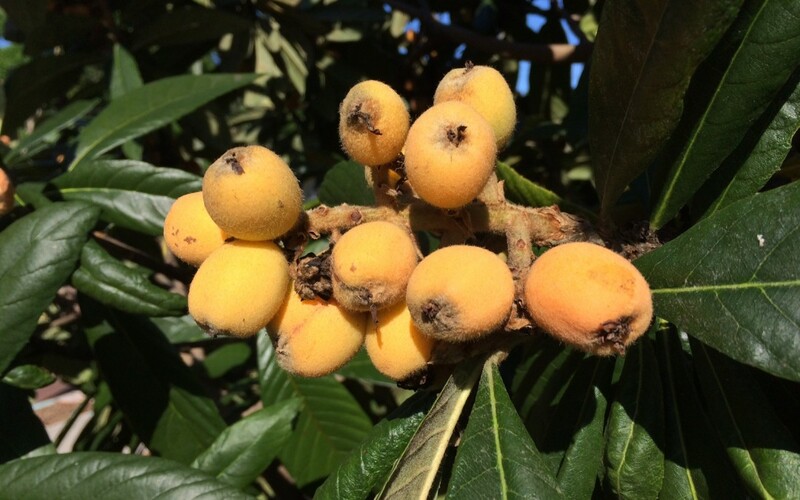 Loquat trees are one of my favorite elements to an edible landscape because the plant itself is quite attractive. It is evergreen, so you don’t have to worry about bare branches in the winter, and the large leathery leaves are very tropical looking. Well anyhow, you can see the bumper crop of loquats we have on our tree this year. I enjoy grabbing a clump to take on the walk around the block with the dogs, but that is not even beginning to put a dent into our loquat crop this year. There are so many on here that even when I harvested this large box of fruit it made absolutely no difference in the amount of fruit on the tree. The branches are actually hanging low because of the weight of the loquats. 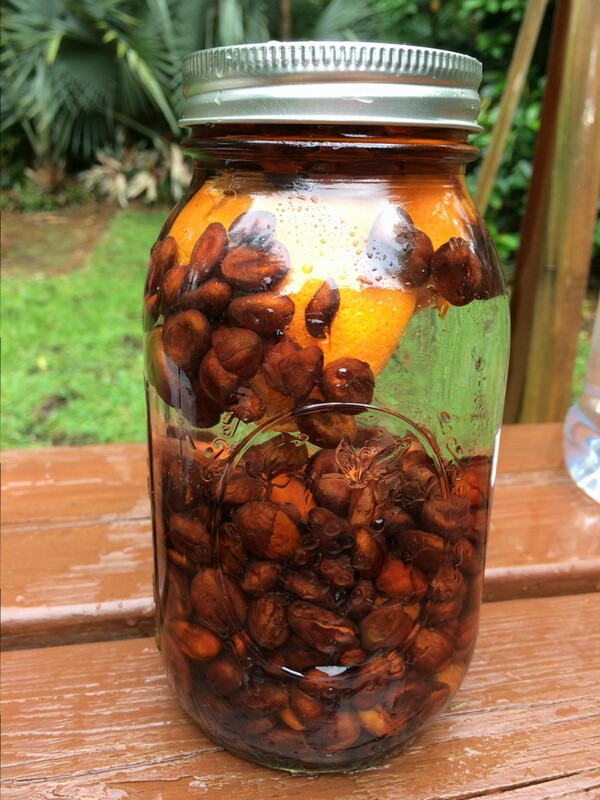 To start our testing of loquat recipes I did some online searching and generally came across three things: loquat liqueur, loquat grappa, and loquat jellies and jams. I really thought I would get to the jellies and jams too! We have made liqueur in the past when we had an overwhelming amount of calamondins. It was a beautiful alcohol and didn’t require much work, and each of our friends that we gave it to for Christmas seemed please with the homemade gift and thought. To get started on the liqueur I was slightly disappointed to read that it was going to take more effort with loquats: each fruit needs to have the flower end cut off and the seeds removed. Not the end of the world. 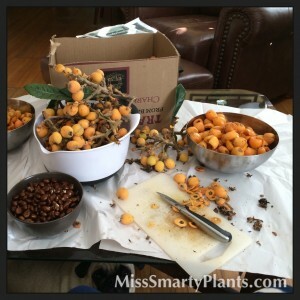 We set up a little “loquat processing area” on our coffee table where we could watch the NCAA basketball tournament while working on this. We made sure to have a bowl to save the seeds for the other part of our recipe project. I roughly used the recipe from Enchanted Fig, although I deviated a little bit (peeling was not going to happen!). 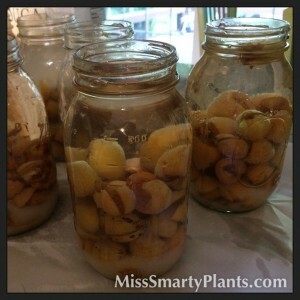 – Loquats: I filled each jar half way with the fruit, so determine the quantity and size of your containers before starting. – Sugar: I used approximately 1/2 C. for each pint jar. – Airtight containers- mason jars work really well and are fairly inexpensive. 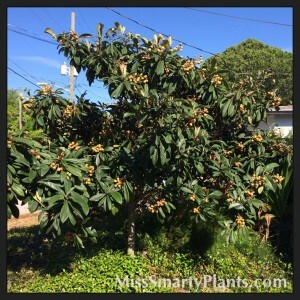 Step 1: Collect bunches of loquats from your tree or farmers market. I can tell you that the box shown above made 6 pints of loquat liqueur for us. 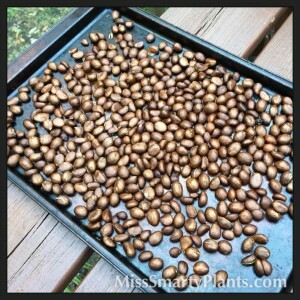 Step 2: With a small paring knife, cut off the blossom end and remove the seeds. 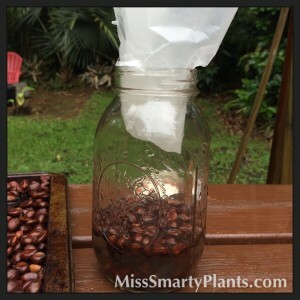 Tip: Keep the seeds in a bowl for project #2! Step 3: When you have enough fruit simply pour into a mason jar, add sugar, and fill to the top with vodka. Don’t be surprised if the sugar doesn’t all dissolve. It will take some time. I should mention that to a couple of our jars I added pieces of fresh ginger to add another flavor. I love ginger and I am hoping to add some of that spiciness to this concoction. Love lemon? Add some lemon to yours! You can really try about anything with this. Step 4: Find a place to store your jars while they do their thing. Turn them over once a month or so to help the sugar to break down. Step 5: My downfall: wait. Yes, even after all of the efforts that you’ve put in to this you will be rewarded if you can wait at least two months and preferably 3 or 4. 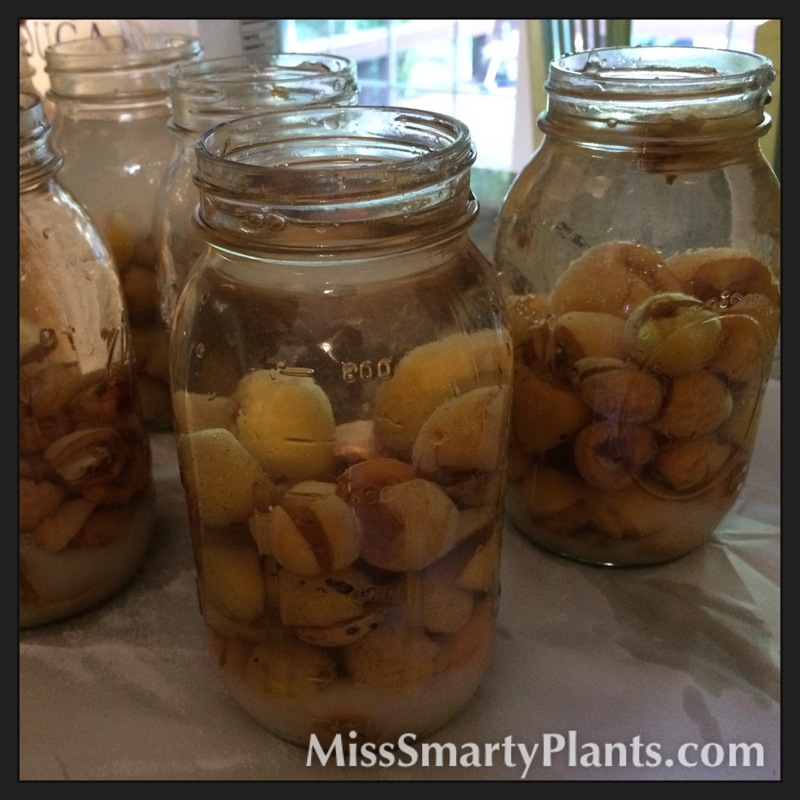 The next part of our project was to use the seeds to make Loquat Grappa. I don’t even know what grappa is, but the best I can determine is that it is an alcohol made with the leftovers from the wine making process. I essentially followed this recipe on Gardenista for this process. It suggests leaving the seeds to sit out in the sun for a week or two. No problem there. Well, no problem until it rained. Yep, all of our hard work and these little babies were swimming in the baking sheet. I should say that I could actually smell the cherry scent in the water and seeds so I do think there is promise! 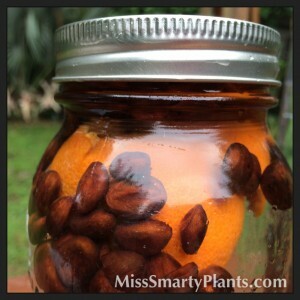 After finding our loquat seeds floating I decided we might as well get going and add them to a mason jar. The classic Italian recipe calls for grain alcohol, but a neutral vodka works as well. To the pits, add one whole vanilla bean and 1/4 of a lemon rind, pith removed. Let this sit in the sun for about a month. Add a sugar simple syrup to taste, and then let it sit for another two weeks. In traditional Chinese medicine, it’s believed that the seeds of loquats suppress cancer. So toast to your health. Now I didn’t have any vanilla beans or lemon rinds around. So I added an orange rind instead… We will see. Apparently with grappa you add a simple syrup to the alcohol as you pour it for drinking, instead of adding the sugar directly to the jar. I like this philosophy as it lets each person drinking it to make their own drink based on preferences. 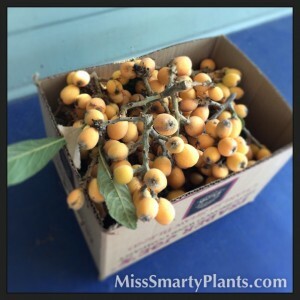 Have you tried loquat recipes before? Anything you would recommend with my last few days of usable loquats on the tree?